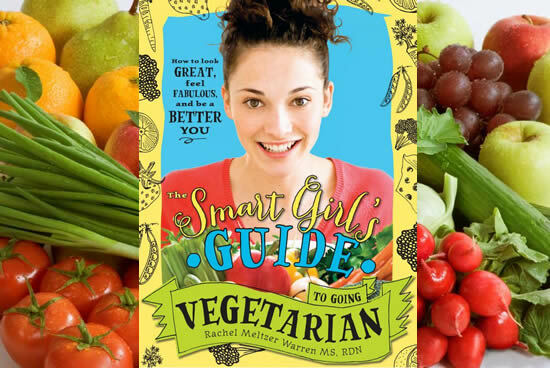 The Smart Girl’s Guide to Going Vegetarian is a book targeted to teenage girls who are considering a teen vegetarian diet. The author is nutrition educator and counselor, Rachel Meltzer Warren, who became a vegetarian at the age of twelve. This vegetarian diet for teens offers advice to help teenagers stay healthy as a vegetarian. It offers a general introduction to a vegetarian lifestyle and dispels common myths about the diet. Also addressed is the subject of how a young girl can talk with parents who are questioning her dietary choices. The book is designed for girls who are contemplating eliminating or even just reducing their intake of meat. Readers are encouraged to first take a short quiz to determine what will work best for them. Warren outlines different dietary styles of vegetarian eating so that girls can figure out which approach they find most appealing. The easiest way to start to explore a vegetarian diet is simply boycotting meat one day each week. This is the best approach for those who want to try a vegetarian diet with little commitment. It can also work for girls when the adults in their life are not supportive of their desire to go vegetarian. It gives their parents the opportunity to experience how easy and healthy a vegetarian diet can be. For those still enjoy chicken and turkey this diet style may work best. Eliminating red meat and pork can provide significant health benefits and can be a first step for an aspiring vegetarian. This category is best if you don’t want to be tied down by specific limitations on what to eat and when. Flexitarians eat a vegetarian diet most of the time but are flexible in their approach. They generally may consume fish, eggs or dairy products a couple of times a week. There are some people who really want to go vegetarian but there are one or two foods they can’t imagine giving up. Warren says don’t let this deter you from exploring a vegetarian diet. The way you eat is always evolving. Giving up meat with one “vegexception” may help you eventually transition to a meat-free diet. The Cold Tofurky – for girls who are serious about going completely vegetarian. The Ethical Carnivore – those who don’t want to go vegetarian but only wish to consume animals raised in a humane way. This vegetarian diet for teens reassures readers that being a “veghead” doesn’t mean you will miss out on essential nutrients. But it also doesn’t necessarily put you on the fast track to a healthy diet. Just like everyone else you need to make solid choices to achieve a balanced diet. Included are examples of daily menu plans that will provide the optimal level of each of the required nutrients. Beans, hummus, tofu, tempeh, seitan, whole grain pasta, bread, quinoa, brown rice, granola, walnuts, almonds, peanut butter, Greek yogurt, organic eggs, salad greens, tomato, cucumber, broccoli, sweet potato, avocado, apples, bananas, berries, olive oil, mustard, chia seeds, nutritional yeast. The Smart Girl’s Guide to Going Vegetarian: How to Look Great, Feel Fabulous, and Be a Better You retails at $12.99. Provides education and information on how to stay healthy on a vegetarian diet. Offers daily menu plans and recipes for quick and easy meals and snacks. Includes vegetarian options for eating out, staying vegetarian at school, college and while traveling. Deals with the subject of how to discuss the choice to become vegetarian with family members. Will probably not appeal to readers outside the target demographic of teenage girls. Does not address the issue of genetically modified soybeans and corn. Some of the recipes contain ingredients that may be unfamiliar. This vegetarian diet for teens is a valuable guide for teenage girls who are considering a plant-based diet. It addresses the practical aspects of changing to a vegetarian lifestyle including nutrition, meal planning and social interactions. Although this resource is written specifically for teenagers, there is also much information of relevance to anyone considering going vegetarian.